netEquestrian offers a vast selection of horse-related gifts for every horse lover on your list. Find the perfect horse-themed gift for coworkers, trainers, farriers, vets, family and all your friends. 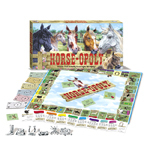 Whether they are young or old, ride english or western, or don't even ride at all, we have the perfect horse-themed gifts to suit their passion. You're trying to find the perfect gift for someone who loves horses. Do they own a horse or just love them?! If they ride, do you know what type of riding they do? We have many gifts that are very specific to horseback riding discipline (dressage, hunter/jumper, western pleasure, etc) and many horse gifts that are more general that almost any horse lover would enjoy. We have gifts in all price ranges to meet your budget. We offer gifts perfect for horse owners and for horse lovers. The best part is that most gifts ship the same or next day so it's almost never a problem to get it there on time, regardless of when you order. Let them choose their own horse gift! If you aren't a horse person or you just aren't sure what your horse loving recipient might love, you might consider a gift certificate. We'll mail or email a gift certificate. From horse jewelry to tack to horse chocolates, horse lovers are sure to find tons of horse-related items they love!